Each year in the planning of Indy Man Beer Con we seek to evolve and shape the event. 2016 is our fifth year of IMBC and we’ve learned a lot and developed each year since our inception. The driving force being to make each year better than the last, for you, the IMBC goer. This year we have made an adjustment to our pricing system that we believe will benefit attendees at IMBC 16. For the first time every beer at IMBC will be the same token price. One Indy Man Beer Coin for any beer at the festival. One token to rule them all. For IMBC 16 we have been working on a token structure that breaks down boundaries, giving all beers at the festival a level playing field. This is in response to the way you, our customers, like to drink at IMBC. In our experience you like to try a bit of everything we have on offer: pale, strong, dark, sour, the lot, and we wanted to make this easier. If you have one token in your hand there will be no limitations on where you spend it. You can take that one token and cash it in at any of the 35+ breweries on any given session on any one of the 150+ beers on offer. As with every year at IMBC, we will continue to use the third of a pint measure. In our minds, and we hope you agree, the third is the perfect serving for a modern beer festival. 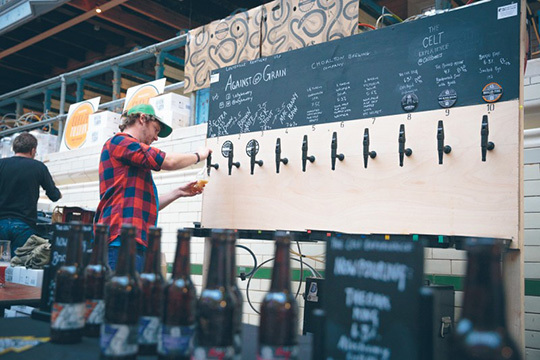 The third, along with the new singular pricing, is an encouragement to attendees to try different beers from different breweries and sample the sprawling array of styles and approaches on offer. Tokens will also be used to purchase food, merchandise, soft drinks, and cider. Alternatively, you could choose to use your excess tokens to take away beer from the festival at either the WeCan canning stall where you can take away any beer available at the festival in a can or from the Beer Merchants takeaway stall. Last year at IMBC 15, where one token equated to £1, prices ranged from one token to six tokens per third. Based on last year’s prices, the average beer cost would have been £2.34. This year, based upon the average of our beer ordering for IMBC 16, we will sell 11 beer tokens for £25*. This translates to £2.27 per token; cheaper than the average cost of a beer at last year’s festival. All tokens are refundable from the token desks**, should you have leftovers at the end of your session. We hope that you agree that the new single beer price makes for a more exciting than ever IMBC for beer drinkers. See you down the deep end! OLD TOKENS: Given that there is a new pricing structure this year, old tokens will not be transferrable.